September marks our 10 year anniversary of helping homeowners renovate happy. We’ve spent some time in recent months taking a look-back at kitchen, basement and bathroom trends over the last decade as well as our Team Picks on our favorite remodels, so we thought we’d have some fun, grab our crystal ball and see what’s coming next in design trends and home remodeling in Reston! We called this one some time ago: we see the shift away from all white kitchen cabinetry as one of the BIGGEST trends in coming years. However, no-one wants to spend big bucks on a kitchen remodel to find it quickly dates and is out of style within a few short years. There’s a way to do a remodel right if you want to make a bold statement in your kitchen. It doesn’t have to be ultra-modern to get the look. The design should be in keeping with your home’s aesthetic and good design will last years. Not ready to commit and want to play it safer? Then white and neutral cabinetry is the way to go but you can really dial it up a notch with the backsplash or fixtures – these items are easily replaced if you tire of them in a few years. Wallpaper started to make a comeback in Europe a few years ago and it looks like North America is now ready and willing to give it another chance, too! What was old may be new again, but with an updated look and a modern twist. Gone are the borders and overly-busy patterns. In with beautiful sculptural texture as well as clean, crisp patterns that can totally transform a space! We completed this powder room remodel in Reston a few months ago and it’s a jewel-box joy to behold! NO! I hear you cry. Well, we say YES!! When I moved into a mid-century townhome in Reston, one of the first remodels I did was to pull out the 60’s brown bathroom as well as totally reconfigure the space. Sound familiar? What’s changed over time is how we use space. Older homes tend to have much smaller footprints to work with and darker fixtures and fittings can make it feel even smaller again. Many of us opted for white fixtures to give the illusion of a bigger space. However, new designs and creative thinking means homeowners are more willing to experiment with color again in their bathroom remodel. We like this design that combines two of our predictions – color and wallpaper! Will we see the return of the all turquoise or yellow bathroom? Time will tell! 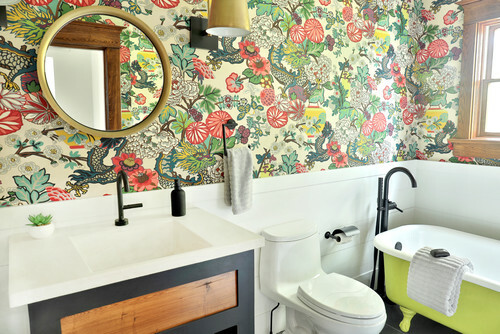 We are calling this new colorful bathroom trend as “one to watch”. Brass was out, chrome and satin nickel were in. Brass started to make a comeback and boy, was it NICE!! The new softer shades of brushed brass have been all over design magazines and TV remodeling shows for some time. 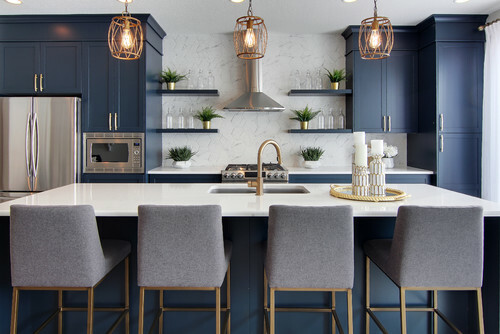 They can bring warmth back to a space or act as a way to blend with other brass fixtures in the home that you might not be ready to switch out yet. Now it has been taken a step further with mixed metals in a space. You might not think this one would work, but think again. Gone are the days when everything in a kitchen has to match. This beautiful kitchen remodel shows how mixing metals doesn’t mean a lack of cohesion – and note the cabinet color! We are going out on a limb here, but we LOVE this one. Once a sure way to lose a sale, believe it or not, sunken living rooms are making a comeback! Whether you refer to it as a “recessed living area” or “conversation pit”, what was once a complete turn-off for many people is now (albeit slowly!) regaining popularity. As with all things, you aren’t going to get away with simply telling people your space is now “cool”. It has to be done right. It needs a talented interior designer to recreate or re-envision the space along with the right furniture so it doesn’t feel – well – outdated! We know we have a few of these gems in Reston ready for a remodel, so don’t write your sunken living room off just yet. Synergy Design & Construction: Here’s to the next 10! We love what we do! Ready to break from the norm and be unique in your styling? Our Interior Design team works with you to allow your personality to come out in your home! We value our client’s trust in us to turn their vision into reality with design that lasts the test of time. Want to see more? Take a peek at some of our previous remodeling projects or Contact us to learn more about our custom design/build services.